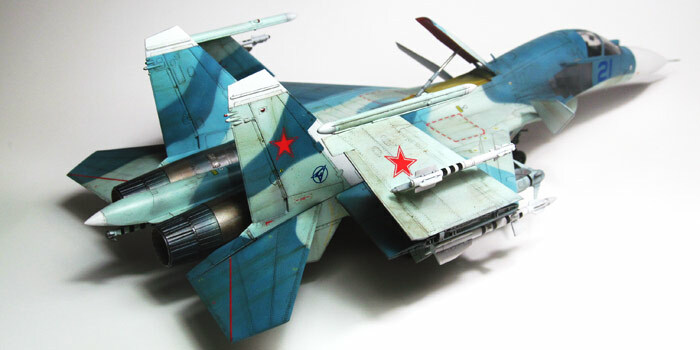 I have been beavering away on this old Sukhoi Su-9 and its just about time to close the fuselage. The seat has been a lot of fun. I got an Eduard "fabric" seatbelt set for a MiG-21, the closest I could find for this model. They are really die-cut printed paper with PE parts. The builder is supposed to be able to thread the paper through the PE buckles to make a realistic looking set. Haw! I can barely SEE the damn things and after spending an evening trying gave up and glued the PE on top. It looks almost as good and considering all the other issues with the cockpit I will not loose any sleep over the belts. This picture shows were the project is now. The front wheel well is partially assembled and has been painted. It will need a wash or three and detail painting before final assembly. The nose gear gets trapped inside the box and then that gets trapped inside the fuselage. I can't see any easy way to mask this off. Any ideas? More progress on the Su-9 to report. I screwed up the nose wheel well. It got two nice coats of light grey enamal and I let it sit 24 hours. The next evening it got a wash of flat black which krinkled the grey. No worries, I'll wash it all off with lacquer thinner. I forgot that some plastics melt in this stuff and the part got slick, slipped out of the tweezers & into the jar. After fishing around for some time I had to pour off the solvent and only then could recover the partially melted part. I let it sit overnight and then reworked it with a sanding stick & an Exacto. It will be OK to hold the landing gear but will never be worth looking at. Like they say in the Navy, I welded it together & painted it grey, a dark shade to try to hide the damage. Last night the fuselage halves went together and I painted the seams with liquid cement. I'll try sanding those seams this evening and see how good my fit was. These large pictures sure show up the flaws in my detail painting . . .
Me thinks you're being to hard on yourself! Looks pretty good from here! Thanks John, it looks OK with my glasses too. Blown up on the screen can get scary . . . Looking at the days left to complete makes it obvious that some things will have to be given up to get this project in before the gong. First, I'll leave the stores off. I often like to leave the plane bare anyway to better reveal the shape. I may have to forego the primer coat also and just go directly to the MRP Duraluminum. We'll have to see about that . . . I thought is might be fun to show a picture found online of an Su-7 cockpit which shows the color that the Su-9 was probably also painted. It looks pretty close to the MRP Grey-Blue paint. I ran into some trouble with the seams last night. I had hopes that by careful fitting and the use of liquid cement the seams would not be an issue. Last night I was using the new to me Micro Mesh pads and polishing down the surfaces the seams appeared on the fuselage joints. The seams on the wings & tail were pretty good but the ones on the fuselage were still there in places. I went back to square one and had at them again with a sanding stick hoping to find the bottom of the trough. In the end I was thoroughly disgusted with my approach. I ran new liquid glue and will see what we have next work session. I may end up having to try another new to me technique, using CA glue as filler. All my panel lines are gone on the top & bottom but at least it will be smooth! Hi to all campain attenders. I'm new there and foud this campain. 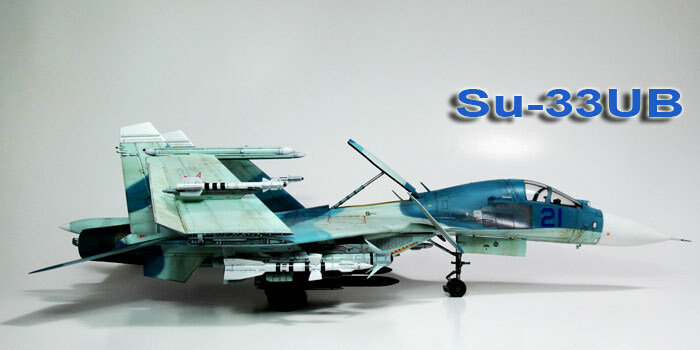 I started my SU-27 in october last year. So I report there my progress and also final model. 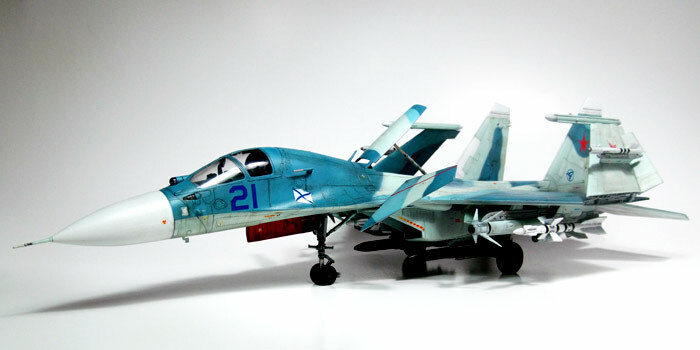 So, I builded SU-27UB, 1/48 from HobbyBoss. Thema: Russian spring in Siberia. Before flight to repair factory. Additional accessories: resin Pilots, PE details. Martin - this is all looking very nice! Your stencils are amazing. Are they a commercial product? Do they stick to the surface? I look forward to seeing more of this project. Hi Paul, thank you. The final photos are in Gallery now. About the stencils: This specific stencils will released soon. You will find, not only, them on www.miryoku.cz. Write me PM, I will send you more information, when you are interested in. ;-) We were looking for material more than 1 year. Is semitransparent, glue is strong not much but strong to prevent under spraying. This one copying survace excelent. Martin, that is amazing! Everything looks great, I love particularly the subtle weathering and the snowy airfield. Thanks for sharing. Thanks Carlos, my pleasure you like it. Nice job! Love the weathering effect! Yours is coming together, and looks great! I'm getting close and if all goes well I stand a chance of completing before the deadline. Tonight I'll install the canopy & do some clean up of glued joints from last night. Then it will be masking, something I'm always nervous about. With luck the aluminum MRP finish will go on Saturday and the decals & clear coat Sunday. I'll still need to do final assembly so I hope the clear dries quickly. I'm crossing my fingers for a bit of modeling luck . . .
Well done Paul and good luck Im looking forward to finished Su. Martin Benes (Gartik61): I feel a cold wind flowing in my eyes. 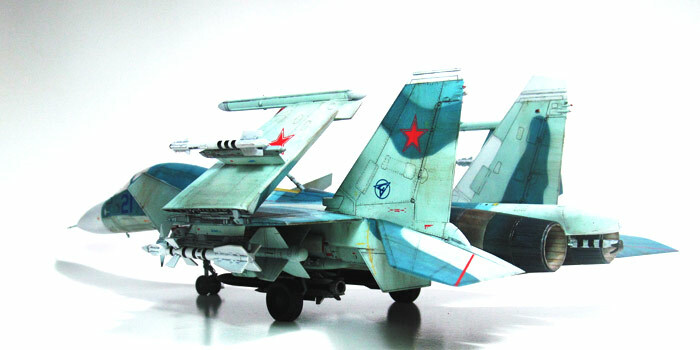 I had done my Su-33UB in 1/72 scale. Thanks all for this great air campaign. K., that is a great looking model. Amazing painting and weathering. Congratulations. 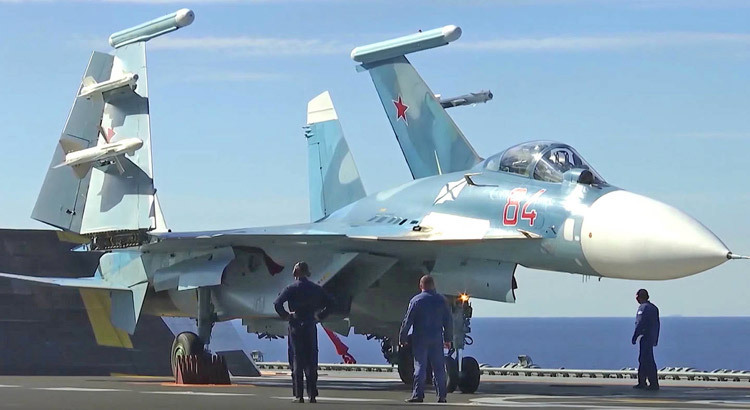 A Su-33UB and a Su-33 on the Russian aircraft carrier. Thank so much, Martin and Carlos for your kind words. I forgot, Russians :-D 蘿 Superb build. I didn't make it. Modeling luck was not with me and this Fishpot will not be finished today. Today I will shoot the model a third time with Krylon metallic silver. 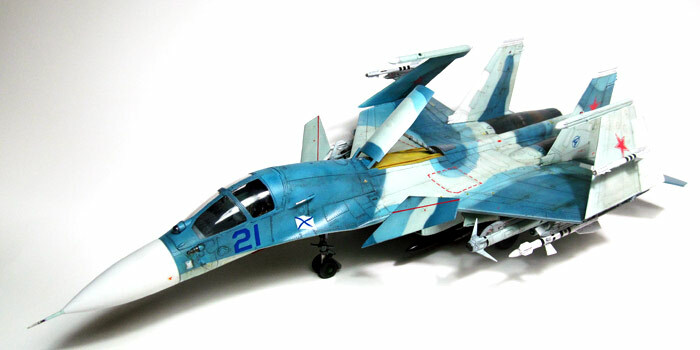 Even though I have missed the deadline, I'll finish this Sukhoi. It has been an education and that has been worth something. Hi Paul, looks like a surface defect. Did you polish surfacer before silver paint? You can use Tamiya polishing cloths. Thanks Martin for the tip about the Tamiya polishing cloths. I have not heard of them before but will see if I can order some. I did not polish the whole model, only areas where I had worked. Those came out pretty nice. I have been building armor since I came back to modeling & the techniques I had learned building models like a 1943 T-34 do not all work on a 1960 Sukhoi . . . I shot a third coat of paint this morning out of a Krylon rattle can. This covered much better and looks reasonably good. Decals Tuesday then a clear coat & washes. I'll finish it and it will be a step toward the next natural metal project. I have a kit of the Firebar that looks like fun down the road.